Comrades, hundreds of tracts are published every day. Choose the best and reproduce them yourselves or send them to the printers who are on strike. REPRODUCTION OF SOME TRACTS DISTRIBUTED IN THE SORBONNE ON MAY 16.
the immediate occupation of all the factories in France and the formation of Workers Councils. The supremacy of the revolutionary assembly can only mean something if it exercises its power. For the last 48 hours even the capacity of the general assembly to make decisions has been challenged by a systematic obstruction of all proposals for action. Up until now no motion could be voted on or even discussed, and bodies elected by the general assembly (Occupation Committee and Coordinating Committee) see their work sabotaged by pseudo-spontaneous groups. All the debates on organisation, which people wanted to argue about before any action, are pointless if we do nothing. AT THIS RATE, THE MOVEMENT WILL BE BURIED IN THE SORBONNE! The prerequisite of direct democracy is the minimum support that revolutionary students can give to revolutionary workers who are occupying their factories. It is inexcusable that yesterday evenings incidents in the GA should pass without retaliation. The priests are holding us back when anti-clerical posters are torn up. The bureaucrats are holding us back when, without even giving their names, they paralyse the revolutionary awareness that can take the movement forward from the barricades. Once again, its the future that is sacrificed to the re-establishment of the old unionism. Parliamentary cretinism wants to take over the rostrum, as it tries to put the old, patched-up system back on its feet again. The reform of the university alone is insignificant, when it is the whole of the old world which is to be destroyed. The movement is nothing if it is not revolutionary. 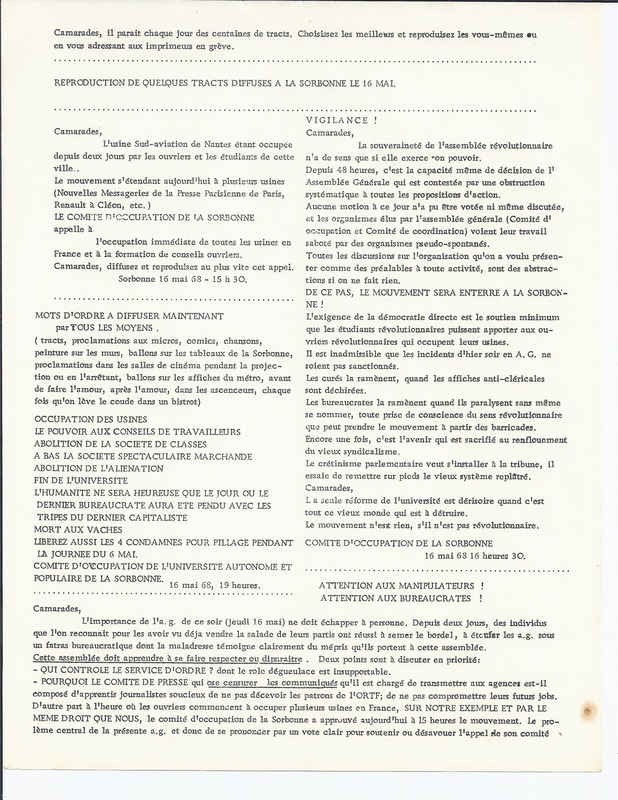 OCCUPATION COMMITTEE OF THE SORBONNE, May 16, 1968, 4:30 P.M.
No one should be unaware of the importance of the General Assembly this evening (Thursday, May 16). Over the last two days several individuals, recognisable from having previously been seen peddling their various party lines, have succeeded in sowing confusion and in smothering the GAs under a barrage of bureaucratic manipulations whose crudeness clearly demonstrates the contempt they have for this assembly. – WHO CONTROLS THE SECURITY MARSHALS? whose disgusting role is intolerable. – WHY IS THE PRESS COMMITTEE — which dares to censor the communiqués that it is charged to transmit to the news agencies — composed of apprentice journalists who are careful not to disappoint the ORTF bosses so as not to jeopardise their future job possibilities? Apart from that: Considering that the workers are beginning to occupy several factories in France, FOLLOWING OUR EXAMPLE AND WITH THE SAME RIGHT WE HAVE, the Sorbonne Occupation Committee issued a statement approving of this movement at 3pm this afternoon. The central problem of this evening’s GA is therefore to declare itself by a clear vote supporting or disavowing this appeal of its Committee.